Notes receivable is a balance sheet item, that records the value of promissory notesPromissory NoteA promissory note refers to a financial instrument that includes a written promise from the issuer to pay a second party – the payee – a specific sum of money, either on a specific future date or whenever the payee demands payment. The note should include any terms that relate to the indebtedness, including when and that a business is owed, and should receive. A written promissory note gives the holder, or bearer, the right to receive the amount outlined in the legal agreement. Promissory notes, are a written promise to pay cash to another party on or before a specified future date. If the note receivable is due within a year, then it is treated as a current assetCurrent AssetsCurrent assets are all assets that can be reasonably converted to cash within one year. They are commonly used to measure the liquidity of a company. A company’s assets on its balance sheet are split into two categories – current assets and non-current assets (long-term or capital assets). on the balance sheetBalance SheetThe balance sheet is one of the three fundamental financial statements. These statements are key to both financial modeling and accounting. The balance sheet displays the company’s total assets, and how these assets are financed, through either debt or equity. Assets = Liabilities + Equity. If it is not due until a date that is more than one year in the future, then it is treated as a non-current asset on the balance sheet. Often, a business will allow customers to convert their overdue accounts (the business’ accounts receivable) into notes receivable. By doing so, the debtor typically benefits by having more time to pay. Stated interest: A notes receivable generally includes a predetermined interest rate; the maker of the note is obligated to pay the interest amount due, in addition to the principal amount, at the same time that they pay the principal amount. Timeframe: The length of time during which the note is to be repaid. Notes receivable are not usually subject to prepayment penalties, so the maker of the note is free to pay off the note on or before the note’s stated due, or maturity, date. 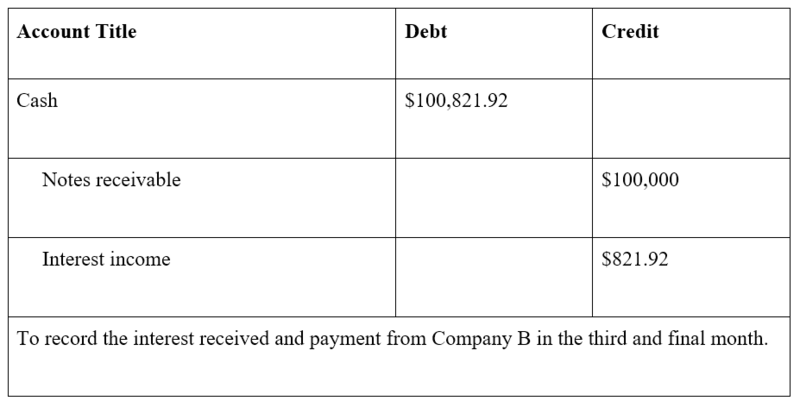 Company A sells machinery to Company B for $300,000, with payment due within 30 days. After 45 days of nonpayment by Company B, both parties agree that Company B will issue a notes payable for the principal amount of $300,000, at an interest rate of 10%, and with a payment of $100,000 plus interest due at the end of each month for the next three months. Alternatively, the note may state that total amount of interest due is to be paid along with the third and final principal payment of $100,000. 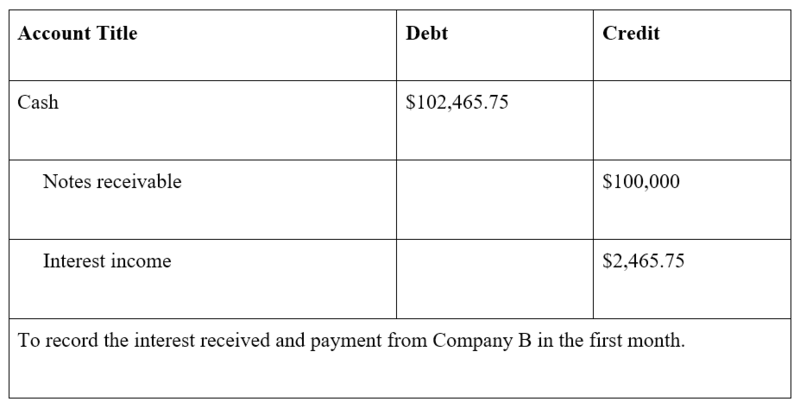 In this example, Company A records a notes receivable entry on its balance sheet, while Company B records a notes payable entry on its balance sheet. The principal value is $300,000, $100,000 of which is to be paid monthly. In addition, the agreed upon annual interest rate on the note is 10%. A note receivable of $300,000, due in the next 3 months, with payments of $100,000 at the end of each month, and an annual interest rate of 10%, is recorded for Company A. 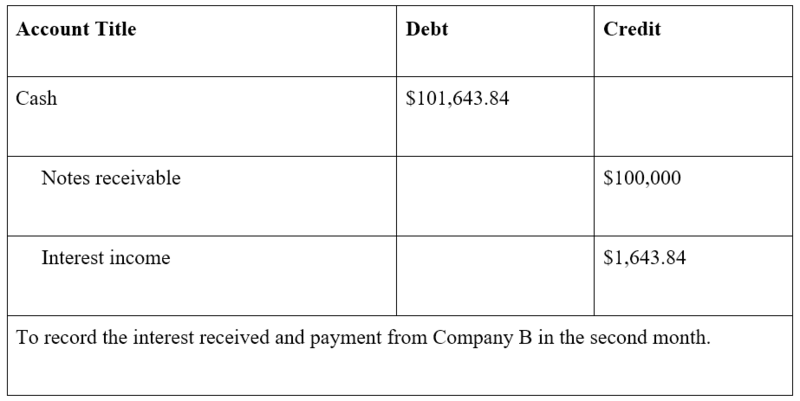 At the end of the first month, Company B pays $100,000 as well as an interest payment = $2,465.75 (calculated as $300,000 x 10% x 30 / 365 days = $2,465.75). At the end of the second month, Company B pays $100,000, along with interest of $200,000 x 10% x 30 / 365 days = $1,643.84. Note that the amount of interest is lower because the outstanding principal amount is now only $200,000 ($300,000 – $100,000), having been reduced by the previous month’s payment. At the end of the three months, the note, with interest, is completely paid off. It is not unusual for a company to have both a Notes Receivable and a Notes Payable account on their statement of financial positionBalance SheetThe balance sheet is one of the three fundamental financial statements. These statements are key to both financial modeling and accounting. The balance sheet displays the company’s total assets, and how these assets are financed, through either debt or equity. Assets = Liabilities + Equity. The main accounting difference is that Notes Receivable is an asset on the Balance Sheet, and Notes Payable is a liability. Notes Payable is a liability as it records the value a business owes in promissory notesPromissory NoteA promissory note refers to a financial instrument that includes a written promise from the issuer to pay a second party – the payee – a specific sum of money, either on a specific future date or whenever the payee demands payment. The note should include any terms that relate to the indebtedness, including when and. Notes Receivable on the other hand are an asset as they record the value that a business is owed in promissory notes, or in other words cash that the business should receive. A very closely related topic is that of accounts receivable vs. accounts payableAccounts Payable vs Accounts ReceivableIn accounting, accounts payable and accounts receivable are sometimes confused with the other. The two types of accounts are very similar in the way they are recorded but it is important to differentiate between accounts payable vs accounts receivable because one of them is an asset account and the other is a. A note receivable is also known as a promissory note. When the note is due within less than a year, it is considered a current asset on the balance sheet. If its due date is more than a year in the future, it is considered a non-current asset. 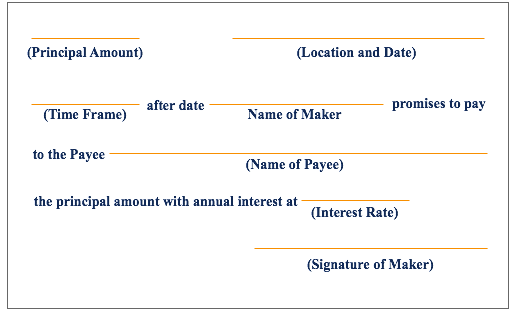 The interest income on notes receivable is recognized on the income statement. Therefore, when payment is made on a note receivable, both the balance sheet and the income statement are affected.